The British dormouse, sometimes called the Hazel Dormouse, is a tiny rodent - head-and-body length 6 to 8.5 cm. In Wales, this largely nocturnal creature is mainly confined to the south and it is rare for them to be seen about during the daytime. Should you be lucky enough to see a dormouse please do not pick it up. 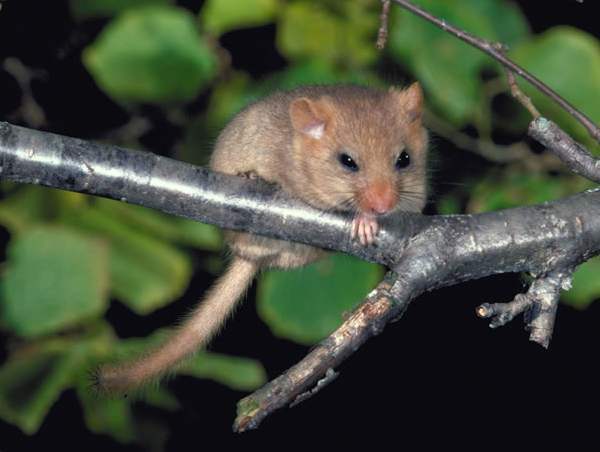 Dormice are very timid and handling by humans can cause them heart failure. Dormice are omnivorous; their diet comprises earth-worms, snails and insects as well as buds, flowers, fruits and tree bark. They hibernate from September through to April, and their spherical summer nests are used both for sleeping and for breeding. Dormice produce one or two litters each year, generally of three to five young.